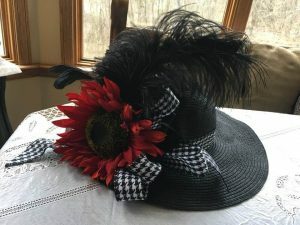 This workshop will include demonstrations and tips to create fabulous decor for your hats. Holly will guide participants to create a unique hat with things you can detach, reuse and change the look of your hat. You can bring a hat or purchase a hat from Holly. She will have a variety of brands, including: August & Co, Hatter, Calvin Kline. The cost of the workshop is $40 and includes a glass of wine to start your inspiration! Additional items are available to purchase from Holly to create a one of a kind masterpiece and changeable looks. Visit her Facebook page, Tailored Florals By Holly “The Crummy” 740584-4232 for more pictures and samples of what she can help you create that evening! Reservations are required with payment in advance. Please contact us via Facebook Messenger, Instagram Message, email at vinamizanesville@gmail.com or text Alana at 740-819-7289 to confirm a spot.